This season finale changed up the usual formula for this show. Until now we have gotten the same basic storyline. Some new villain shows up, wreaks havoc, our characters fight them and fix it. Only then someone else comes in and makes a mess of things. This finale took out that outside force and centered the trouble on one of our own. The force that is threatening everyone’s lives and happiness is from the inside, Emma. Our main protagonist, the savior is now full of horrible darkness. Before we got to the point where we saw Emma become The Dark One we had to endure the chaos that Isaac created when he wrote the new story. The episode opened with Isaac becoming the author. He chose the quill and a door opened for him to a whole new and exciting world. A world that he does not appreciate. We learned from this episode that being a writer was always a dream of Isaac’s. Unfortunately Isaac made the worst mistake an artist can make. He wanted to write to get himself famous and loved by all those around him. He didn’t want to tell the world stories that he thought they needed to hear. He wanted to stick it to the people who he thought treated him badly. He wanted to get revenge on his boss who under appreciated him. He always saw himself as not appreciated for his talent. What he never did though, was sit down and use that talent as it should be used. He always wrote with notoriety in mind instead of just telling the stories that needed to be told. He wanted control and power and that is where he messed up. When Isaac was given the opportunity to write a new story, one where the villains won, he did not prove himself one bit. All he did was rewrite the story we already had, flipping the characters around. Regina told a secret that got Snow’s love killed instead of the other way around. Isaac was standing on the edge of being able to write a new story, one that could prove WHY villains deserve a happy ending. Instead he just wrote a lazy tale and wrote himself famous. He never deserved his happy ending because he did not work for it, unlike the rest of the characters. They found their happiness by realizing what they had in front of them. Something Isaac was never able to do because he was too selfish. Isaac attempted to make himself happy at other people’s expense. That tactic is what makes him a villain. Taking your happiness from others and leaving them desolate and miserable never works. Isaac again did not want to explore his talent and see what he could do. He did not want to have to work at it diligently. He wanted a quick and easy solution. He thought he was owed something and he wasn’t going to wait any longer for it. In the end he wrote his own destruction. At the end of the last episode Rumple was one of the few left that was not happy, because he did what Isaac did, he destroyed himself. In the new story of “Heroes and Villains,” by Isaac, Rumple was now “The Light One,” (again zero originality on Isaac’s part). Rumple was the knight in shinning armor that rode in and saved all those around him. He was loved, respected and no one feared him. He had Belle and a new child. I wondered this whole time what exactly Rumple wanted in this new story. We see that Rumple was given a life where he was loved by all. He wanted a life where he did not disappoint his son. He wanted a life where he did not choose wrong at every turn. He wanted a life where he was not selfish and did not destroy everything he touched. What we saw though is that Rumple cannot out run that darker side of himself. Isaac comes to him, and warns him that the life he is living is not real. He tells him that in order to keep living this artificial, perfect life he must kill Henry and Emma. 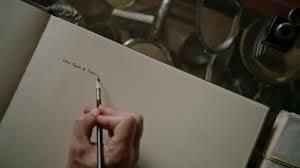 Rumple balks at that idea but it does not take him much time to decide to do that deed. He chooses to protect his family and the life he loves. Rumple is a man who will do anything he can to protect those that he loves. He has killed, he has injured, he has banished and he has utterly destroyed other’s lives to keep what he holds close safe. Rumple is a man who does not think about the consequences of his actions. He wants one thing and he will get it no matter what. He never considers who he is hurting or what he is destroying in the process. Even in this new world he still makes these types of choices. Before he became The Dark One Rumple was a coward. He was pushed around, never standing up for himself or anyone else. He was always hiding in a corner somewhere. Then he became The Dark One and he went to the total opposite direction. He stopped thinking about those around him and considering their thoughts and lives. Instead he used his power to abuse those around him. You threaten his son, he kills you. There is no second thought or consideration of what he is doing. Regina was much like this, clouded by anger, pain and revenge but she learned how to find a middle ground. She still will protect those she loves but she always thinks about what she is doing. Rumple needs to learn where this middle ground lies. There is no harm in protecting those you love but destroying others in the process is not right. Finding this middle ground may now be an actual possibility. Rumple is no longer The Dark One. The apprentice took out the darkness from Rumple. At the end of the episode Rumple is still unconscious and the apprentice said it will take time for him to heal and find himself again. It has been a very very long time since Rumple was not consumed by the darkness of being The Dark One. He no longer has power. He no longer has that temptation. So it will be interesting to watching his journey of finding out who he truly is without all of that hindering him. Can he become like Regina and find a way to live happily with Belle? Unfortunately the darkness had to go somewhere. The hat could not contain it, and in the end Emma was the one who took it. The darkness needed a soul to inhabit and Emma is now that soul. We spent half of this season watching Emma fight the growing darkness inside of her. Snow and Charming did all that they did in order for Emma not to ever become dark and now she is housing the darkest power of all time. Next season I believe we are going to be getting a very different Emma. The power made Rumple not fear anyone and power hungry. The lure of the power and the control made Rumple lash out and hurt others. He stopped caring about protecting everyone around him. He became focused on his own goals and his own goals only. Will Emma stop trying to help everyone? Will she only care about protecting her family and will she do so at all costs? Emma finally opened herself to all those around her. She forgave her parents and realized how important they are to her. She is now good friends with Regina. And she told Hook that she loved him. Will this help her in the long run? Will having this love inside her be enough for her to deny or fight the growing darkness? Will all those around her be able to save her? Can true love defeat this evil or is even that not enough? Next season will be interesting as we watch Emma fight to not lose herself while Rumple struggles to find himself again. “You don’t tell stories people want,” – Isaac’s boss- He has a point. This is because Isaac is out to tell stories to get himself famous. He is not concerned about telling the stories that need to be told, which defeats the purpose of being an author. “You gave me the worst thing anyone can give someone, hope,” – Regina- I like this quote just because it shows the juxtaposition of the idea of hope. Hope can build someone up and it can tear that same person down. Hope can be the greatest evil or the greatest joy. It all comes down to the person holding it and the situation they are in. “Best way to show love for those that are gone is to tell their stories,” – The Apprentice – He tells this to Henry after Henry learns he is the new author. Henry understands the importance of stories but he also knew that the temptation of the quill was too much for him. He broke it and broke that power. Henry will tell the stories of those he loved one way or another though. Were all the other authors from the mortal world? Is there going ever to be another author? How much power does he possess? Can Merlin save/help Emma in anyway? Will Rumple have to help Emma with her new power since he’s the only one that has been where she is at? What will happen to Zelena after she gives birth? What will that child be like? Will he play a role in Emma’s new dilemma or be outside that? How long until the power corrupts Emma? Can she fight it? Is her families and Hooks love enough to keep her sane and save her? 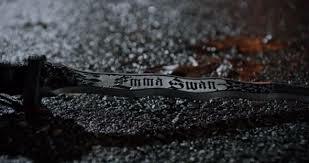 Posted on May 11, 2015, in Once Upon a Time, Tv Shows and tagged author, dagger, Dark One, Emma, Isaac, Once Upon a time, Operation Mongoose, Rumple, Season four finale, tv show review. Bookmark the permalink. Leave a comment.